Using ground-based telescopes, all-sky surveys and even the Hubble Space Telescope, astronomers have found a suicidal asteroid that is flying apart thanks to solar heating and subsequent infrared emissions that cause it to spin faster and faster. Known as 6478 Gault, the asteroid measures four to nine kilometres (2.5 to 5.5 miles) across, and features two comet-like tails of debris being released into space. The asteroid is in a destructive spin caused by a phenomenon known as YORP torque. As the body is warmed by the sun, infrared radiation escapes that carries away heat and momentum. This small force causes the asteroid to spin up to the point that centrifugal force can eventually overcome gravity. As the body becomes increasingly unstable, landslides can cause rubble and dust to stream off into space, creating one or more tails. Of the 800,000 known asteroids between Mars and Jupiter, YORP “disruptions” occur about once per year. 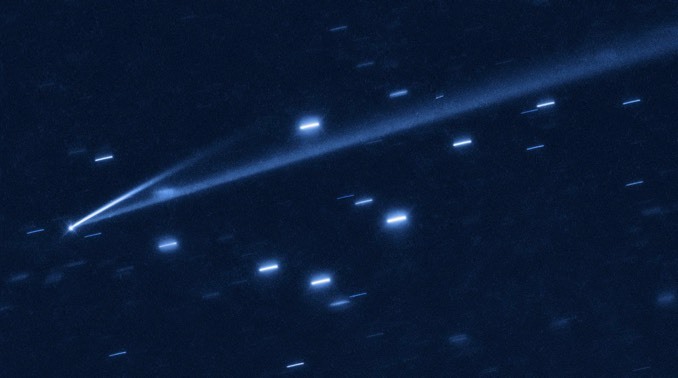 Gault’s debris tail was first observed by the University of Hawaiʻi/NASA ATLAS (Asteroid Terrestrial-Impact Last Alert System) telescopes on 5 January 2019. 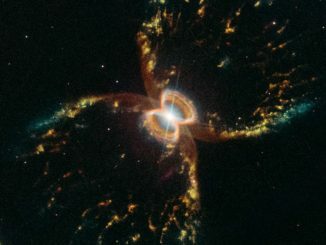 Archival data showed the tail actually was observed earlier, in December 2018, and a second, shorter tail had been seen by various telescopes shortly thereafter. A detailed analysis suggested that the two events that generated the debris tails occurred around 28 October and 30 December 2018. Follow-up observations indicated a two-hour rotation period for Gault, right at the threshold required for material to begin tumbling and sliding across the surface. The tails are expected to be visible for a few months before the dust in them is fully dispersed. 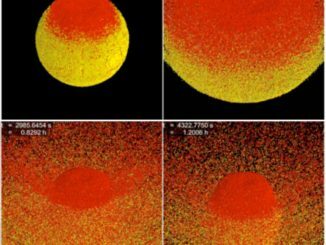 A new computer model indicates it may be tougher to break up a large asteroid on a collision course with Earth than previously believed. 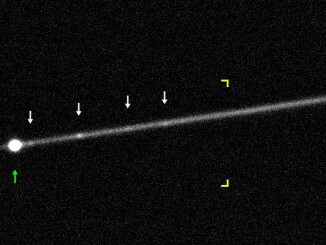 Astronomers used the 10-metre Keck II telescope in Hawaii to examine a so-called active asteroid, P/2012 F5, that mimics a comet with a tail, but ejects dust like a shot without an obvious reason. The researchers found that it had a very fast spin rate and probably fragmented.